The first thing you need to do is make sure you are registered with the website. If you already have an account you can login. If you do not then you first need to create an account. Detailed descriptions of both topics can be found by clicking the Info link at the top of this page. I Created and Activated my Account. Now What? Go ahead and login to the website. Just click the Login link in the upper right hand corner of the page. 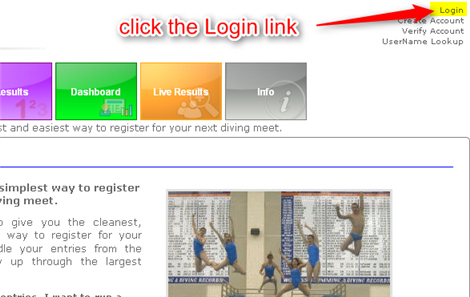 Once you've logged in you can click the Meets link to view a list of all meets in the system that you can register for. Select any meet that is currently open for registration. If you are an athlete then you can click the event name of the event that you want to compete in. If you are a coach you can register your athletes for a meet and enter their dive lists for each event they are competing in. More detailed instructions can be found by clicking the Info link at the top of this page and then clicking on the appropriate topic that you want to learn more about. How Do I Get My Meet Setup on your Site? Please visit the meet information page. That page lists all of the information we will need in order to post your meet on our website. Click here to go to the meet information page. What Aren't All of the Pages Enabled on this Site? The site is currently in an open BETA. What does that mean? Well, it means that not all of the links and functionality are enabled yet. We are continuing to add new features and functionality all the time so please check back often.